A fantastic evening was had by all! You can see the full set of images by David Pang here. Read more about Opening Reception Time! 2013 Artwork has been chosen! 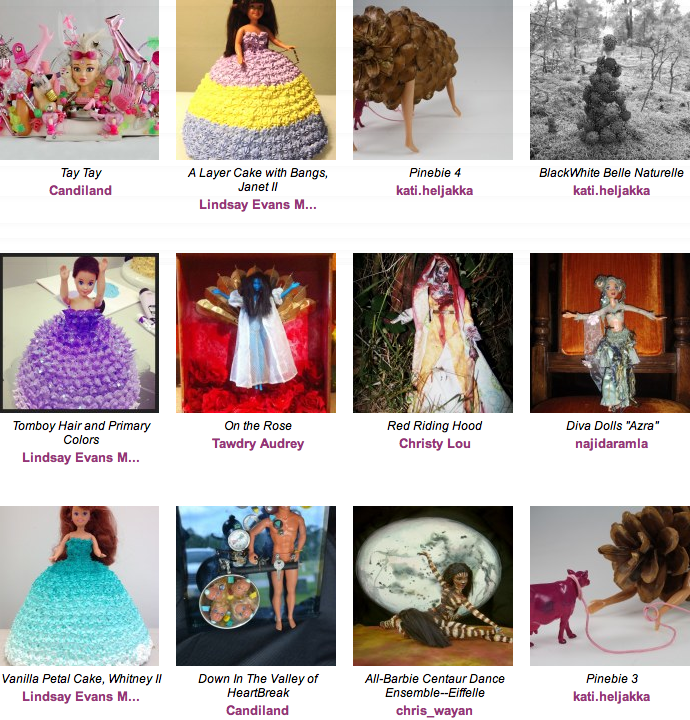 The curation team has selected artwork for Altered Barbie 2013. You can see all the great work here. Read more about 2013 Artwork has been chosen! My name is Kati and I've just joined the Altered Barbie community. I got in contact with some amazing Barbie-art in San Francisco last fall, when visiting my toy friends in California. For the past 4 years I have concentrated on adult toy play as both a researcher, artist and player. My toy-related photography, what I refer to as 'photoplay' has participated in many art exhibitions around Finland. "The Doll That Has It All"
AlteredBarbie 2013: The Doll That Has it All! Tuan Tran Couture & ArtTuan Tran– Fashion and Art Biography and ApproachTuan is focused on creating Haute Couture garments of stunning beauty, made primarily from recycled or re-purposed materials. Materials such as recycled telephone wire and re-purposed manufacture's cloth material samples. His designs range from the ultra wild and edgy - made of wire to the elegant hand woven garments from cloth. Other garments by Tuan are hand painted, and appear to be a wearable paintings, with others made from unusual cloth materials. His approach is to have the garment defy the source materials, with beauty that is undeniable.Tuan has a business background and studied accounting and engineering. Almost time for Altered Barbie Show! 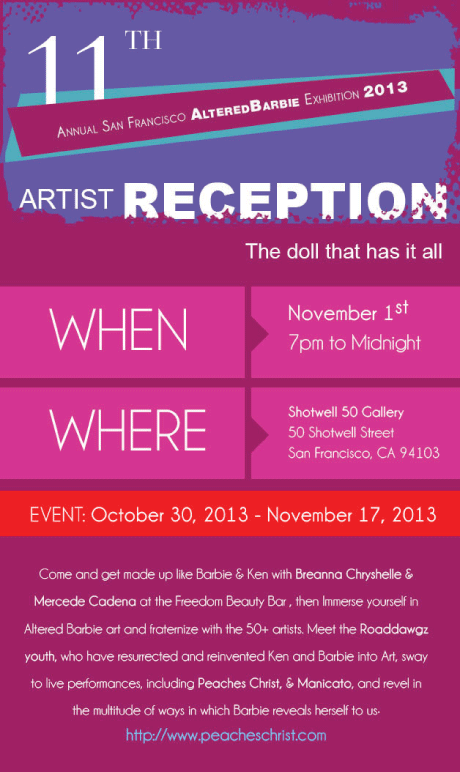 Read more about Almost time for Altered Barbie Show! Out of all the White House Couples; I have read about this lovely couple takes first place and more; of what family and love can be, a good example. I love Michelle's fashion artistry and attitude of, Standing behind your man...and with all the things that Mr. Obama has to do, I can say, like the song,"let's Do It Again"! is all, right on! !...chuckle, chuckle... 2013! Boy! have I been busy, y'all, just finished doing a show with the lovely comedian, GINA GOLD, with TMI productions. I performed a few humorous jokes with a medley of songs, this pushed the delightful crowd into more of what was already happening"happy mode" and alot of laughs and fun. Gina, asked me to return to her next up-coming show, over at La Pena Cultural Center in Berkeley, Ca. November 21, 2013, 7:30PM Pacific time..tickets, are $ 10.00 in advance and $13.00 at the door. The 10th Annual San Francisco Altered Barbie Show. AlteredBarbie is running for President and on campaign with or without AlteredKen! AlteredBarbie is running for President: Included are some of her campaigns! AlteredBarbie uses hot glue guns, not real guns! AlteredBarbie says separation of Corp & State! AlteredBarbie says Recycle, Reduce & Reuse! AlteredBarbie says yes to "sparkle ponies"
AlteredBarbie says yes to teachers unions. AlteredBarbie says No! to corporate education reform! AlteredBarbie says Separation of Corp & the edu-state! 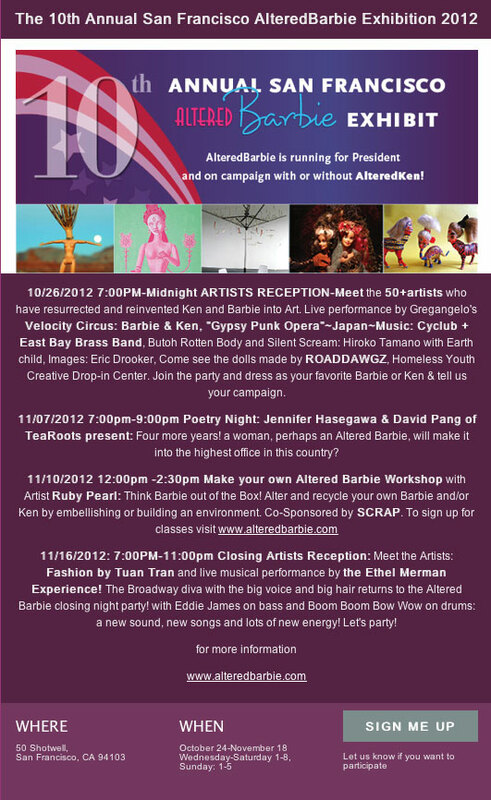 Read more about AlteredBarbie is running for President: Included are some of her campaigns! AlteredBarbie Making Workshop With Ruby Pearl and SCRAP! Think Barbie out of the Box! Alter and recycle your own Barbie and or Ken by embellishing and/or building an environment. Price per participant: $25.00 / 35.00 special for parents. This includes 2 Barbie dolls per person. 10 person min. Place: 50 shotwell in the Mission district of San Francisco. Read more about AlteredBarbie Making Workshop With Ruby Pearl and SCRAP!